QUICK offers a chance to be published. Teachers, teacher education students, researchers and teacher educators are encouraged to submit articles to QSITE journal QUICK. Articles may feature research,classroom experiences and/or teaching ideas. QUICK is QSITE’s journal and is published digitally for members. This journal has a rich history having been first published in January, 1980. 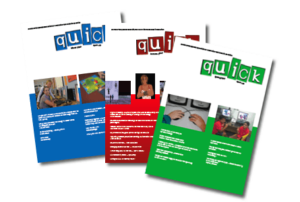 QUICK contains QSITE news and information, celebrates member achievements, and features in-depth articles on developments in ICT education and ICT integration issues in Queensland education. Teachers, teacher education students, researchers and teacher educators are encouraged to submit articles to QSITE journal QUICK. All submitted articles must be relevant to the Australian Digital Technologies education community. QUICK articles are an important way of sharing your knowledge and experiences with your profession. Through sharing your work and innovations you can help colleagues meet their ICT education and ICT integration challenges. However this particular QSITE member service is an important opportunity for collaboration and learning that depends on member contributions via editorial articles or pictorial submissions. QSITE encourages all members to share ICT education or integration experiences or developments with our QUICK readership. QUICK articles have a long tradition of providing relevant and up-to-date information that can support school management decision-making, classroom ICT solutions and student engagement in learning. Take this opportunity to showcase your personal innovations, your school or university’s ICT education achievements or the work of your students. Contact the QUICK team now with your interest in becoming ‘published’ and we’ll support you in the writing and submission process. Please read the QUICK submission guide to help you understand the guidelines for QUICK articles. Full details of the QUICK guidelines can be found in the QUICK Articles Submission Guideline (PDF). A brief editted version appears below. All articles must be submitted as .doc or .docx (Microsoft Word) with minimal formatting. Only electronic submissions are accepted. Any illustrations or photographs used should be relevant to the article and not used for purely decorative purposes. Images should be embedded and submitted within the layout of the word document so designation is evident. Appropriate permission must be obtained for any images used; e.g., photographs of students, work samples, reproductions of the work of others, photos taken by anyone other than the author. QSITE has a permission form available for use if another is not available to you. Any images sourced from print or the Internet must have appropriate acknowledgement for use or permission obtained. All references are to be listed at the end of the article. All references should follow APA style (although preferably using Australian date styles and abbreviations). Any submissions needs to be accompanied by an author’s warranty and publishing agreement (download agreement here) to be completed by authors submitting work for publication by QSITE. Any questions about this warranty should be directed to the QSITE office. Please note, if you wish images of your students to be published in QUICK then you are legally required to have obtained a consent form signed by the student/s and their parent/guardian. Please print off the consent form, obtain the required signatures, and attach to the submission form below or mail to the QSITE at P.O. Box 8, Red Hill 4059 QLD. Submit your article on line using the contact form below. Ensure your article includes your name, contact details and a brief bio for the reader. Attach the word file document. A completed Author’s Warranty form. Include all contact details for yourself with your article, including postal address, daytime phone number, and email address and brief bio. Author’s warranty and publishing agreement to be completed by authors submitting work for publication by QSITE. Any questions about this warranty should be directed to the QSITE office. Articles can be submitted via the online form below or by contacting the QUICK Editor via email at office@qsite.edu.au.